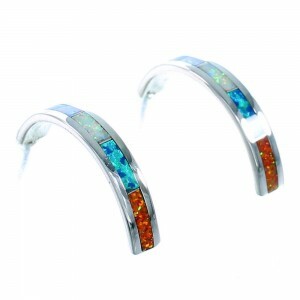 Sterling silver along with man made White, Blue, and Orange Opal. 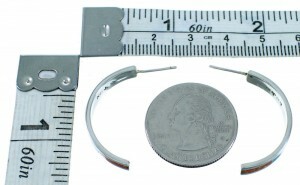 Post hoop earrings measure approximately 1-1/8" long and 1/8" wide. You will absolutely fall in love with this stunning pair of earrings! 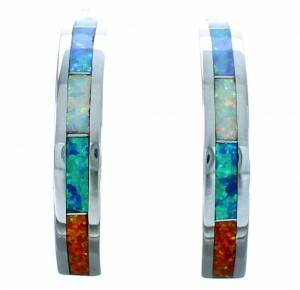 This piece of Native American jewelry is Navajo hand crafted by artist Nathaniel Johnson, out of genuine sterling silver and man made Opal inlay. The inlay consists of: White, Blue, and Orange Opal. The inlay is delicately set, while being accented with thin silver lines for an amazing finish. The earrings are stamped .925 (sterling) and hallmarked by the artist.